I have a card today made using mostly supplies from Simon's February Card Kit. I thought this paper was so pretty, so I simply added a sentiment and some 3D posies (cut from more of the solid papers from the pad) to it for my card. Here's the Kit; if you look closely it has some really fun additions from the norm: a water-brush pen and a sampling of Daniel Smith watercolors, wooden embellishments, some lovely metallic envelopes, and 2 Tim Holtz embossing folders! 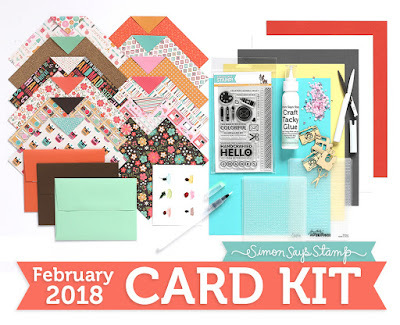 If you have this kit already and have made some cards with it, don't forget to add them to the gallery HERE. You make the most beautiful cards!!!!! Each is prettier than the next! Thanks for sharing!!! Just love your posies with buttons, Lin! Perfect on that patterned paper!! Very pretty, Lin! Love that paper and how you matched your flowers to it.